We have visited and documented forty of the very best of New Zealand's accessible dive sites. Each dive site is shown in full colour wide angle views to give you an excellent feel for the whole site and close-up photographs that document the detail and animals you might find there. 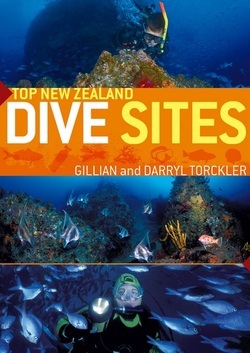 Each chapter (The Poor Knights, Northland, The Hauraki Gulf, Bay of Plenty & East Coast, Cook Straight, South Island & Stewart Island and Fordland) has an overview of the area; each dive site a fact box and description; there is a photographic guide to common marine species (88 fish, 57 invertebrates and 6 types of algae). Interesting geological, historical and animal facts are scattered throughout the book, completing the picture. We take you diving beneath an active volcano; in the semi-darkness of Fiordland’s calm waterways; amongst dense schools of fish; with playful fur seals and amongst the spectacular archways of New Zealand’s most famous marine reserve The Poor Knights Islands. A book to guide you in choosing the best dive locations for yourself , or to remind you of your own New Zealand diving experience. Soft cover with plastic slip cover, approximately A5 size. "It's common knowledge that New Zealand is filled with stunning landscapes, but what lies beneath our waters is a less explored world. Authors Gillian & Darryl Torckler take readers on a graphic adventure through Neptunes playground. After reading each site, the only question is "how soon can I get there?" "